Marketing has moved on from businesses pushing their agenda to wanting to give back to their communities. We’re realizing we are all in this together and that, despite the competition, knowledge is meant to be shared, not sat upon greedily and milked for all its worth. This is not just something I believe in—it’s also what we practice. Through the years we have employed a mix of tactics and strategies to generate engagement, which is crucial for the success of a business. 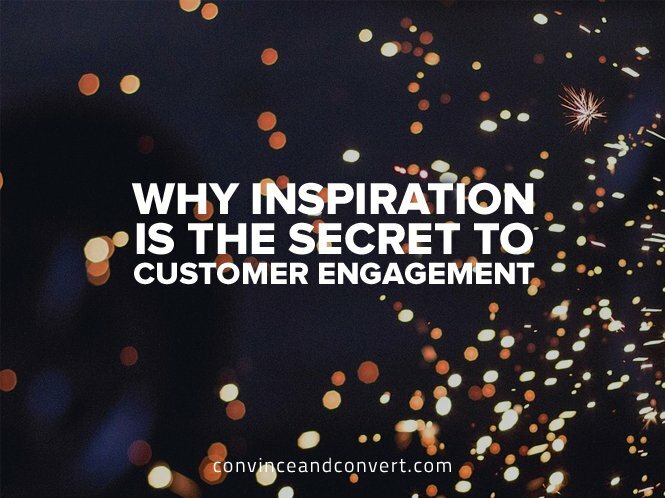 Through this process, we’ve learned many lessons about why inspiring people is the clearest path to engaging with them. When Imaginovation started out way back in 2011, spamming in the name of marketing was common. Businesses were not interested in engaging with their audiences; they just wanted to be heard (even if on random platforms), and that was it. When they were not spamming, they were just talking at people, quite in the mold of traditional marketing. There were a lot of professionals who, despite being knowledgeable and articulate, did not really stand out. I chalked it up to a lack of personality. Our approach differed greatly. We began by keeping our eyes and ears open. In the digital world, this translates to keeping up with the trends, listening in on conversations on Twitter, Facebook, and social media in general, and reading literature that enhances our understanding of the digital space. This process helped us evolve with the world of marketing and implement best practices as we grew. Since we have benefited from so much timely advice from bloggers and influencers, we decided to do something similar: give back insight and knowledge to our audience. We did this, and continue to do this, by creating personalized messages, whether shared on our blog, via social, or via email. Our content is created with a specific audience in mind. We research not just the niche we operate in and the niches our clients belong to, but also the target audiences themselves, which helps us create content that literally and figuratively speaks to them. We don’t spam people. We talk like human beings, we use interesting imagery, and we make sure that our readers are richer for what they have read. This is only possible when you personalize a message and share expertise generously. An influencer is someone who is trying to make a difference in their community. They want to give back to their audience, and this is evident in the content they create. It’s all geared towards equipping readers with the tools they need to build their dreams. When our company started, influencer marketing was still a novel concept. It is on an upward trend now, but still relatively new. Once again, personalized messages help. Take the time to research influencers, as you would a target audience, and write emails they simply cannot move to their Trash folder. Don’t just reach out to influencers—spark a personal connection with them for longer-lasting relationships. Content could be in a written, audio, or visual form. What works well for one industry might not suit another. While we strongly believe in the importance of detailed blog posts, we are aware of the power of the video in the era of YouTube. We have found that with video content, our audience engagement has been up to 60% higher than with just images or the written word. You don’t need a lot of money to make videos, either. For all his billions, Mark Cuban films himself with an iPhone camera and loads the videos to his Facebook in real time. He has people interacting with him as the videos are uploaded. That is taking engagement to an all new level! Short-length videos can work, as can longer ones, but there is no ideal length—it all depends on the platform and your target audience, as well as your message. For example, videos for YouTube work best when they are at least five minutes long. This helps not just with user engagement but also with the searchability of the videos. On Facebook, though, since people are scrolling down their highly personalized feeds loaded with interesting content, they might not be as patient with lengthier videos from businesses, and shorter ones might be more well received. You can only find your sweet spot via experimenting. If you feel your blog posts are not generating the desired user engagement, mix things up a bit by making a video (standalone or to go along with other posts) every now and then. Inspiring and engaging people is all well and good, but if it is not translating into dollars, you won’t be able to take your business anywhere, much less pay your employees month after month. Measuring success is, therefore, crucial. Analytics are your friend. We track metrics using Google Analytics, Facebook Insights, Twitter Analytics, and others before we put out content. We measure the amount of traffic our website receives and our conversion rate, as well as social media numbers, before sending out content to big blogs for publication. We measure these metrics again after the articles have been published. What we find is an increase in social followers as well as traffic to the website. We also receive emails and comments on our posts and have bloggers reaching out to guest post on our blog. If you want to make a difference, be heard, or take your business to greater heights, you need to inspire people. Determine your motive and intent, and make sure that your message is clear. Heartfelt advice presented in an engaging manner is generally well-received. Michel Georgiou is the CMO and Co-Founder of Imaginovation, a full service, turn-key digital solutions company serving Raleigh, NC and Charlotte, NC. He's a dynamic business professional with proven success in creative strategy, online branding, project management and communication projects.